Anthony Gaines attacks the rim. The sophomore guard started again for the Wildcats in Sunday’s loss. For about 35 minutes Sunday night, Northwestern’s offense played as well as it had all season. But as the Wildcats tried to nail down their first win in nearly three weeks, they suddenly stopped scoring. Combined with a complete collapse on the defensive end, NU (12-11, 3-9 Big Ten) blew a 15-point lead in the last 4:30 and lost at No. 20 Iowa (19-5, 8-5), 80-79, after guard Jordan Bohannon hit a fadeaway 3-pointer with less than a second remaining. It looked as if this was the game where the Cats would finally put it together. After averaging just 50 points in their previous three games, NU put up 41 in the first half alone. Senior forward Vic Law was key to the resurgence. Law, who has been battling a lower-body injury that forced him to sit out a game in mid-January, had not scored more than 14 points in a game since late December, but had 19 in the first half on Sunday and 24 overall, shooting 5-of-8 from behind the arc. The Cats also got a solid game from junior forward A.J. Turner, who had 15 points on 6-of-8 shooting. Graduate guard Ryan Taylor had another rough night shooting the deep ball, finishing just 2-of-7, but was 6-for-11 from the field and finished with 16 points. Senior center Dererk Pardon also finished in double figures with 13 points. NU shot above 50 percent from the field for just the fourth time all season, and the first time in conference play. The Cats’ 51.8 mark on Sunday was their highest all year, and their first time above 50 percent since they beat Chicago State on December 17. 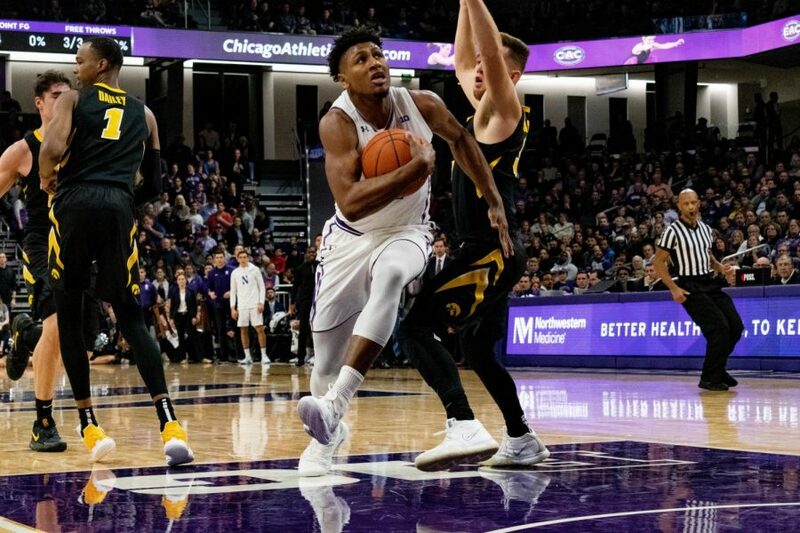 NU had been competitive in most of its games even with the struggling offense because the Cats’ defense had been solid, only allowing 70 points or more six times entering Sunday. But in the game where the offense finally turned a corner, the defense took a major turn for the worse. Iowa shot 5-for-7 on 3-pointers in the second half. The Hawkeyes made their last seven shots of the game, four of them threes. The Cats also committed a few costly turnovers down the stretch, and struggled to break Iowa’s press. The Hawkeyes ended the game on an 18-5 run.